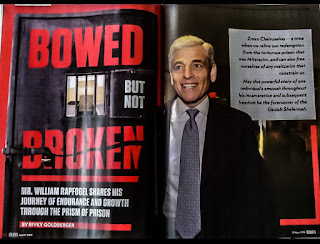 Rationalist Judaism: Going To Prison For Doing A Mitzvah? Have you heard the news? The United States Government has sentenced a number of Jews to prison for the crime of giving charity. Yup, that's right. These people gave money to charity, and because of this, they were sentenced to prison. This has happened to lots and lots of Jews. You might even have heard of some of them - Bernie Madoff, associates of the Spinka Rebbe, etc. Of course, this is a nonsensical way of describing the situation. Bernie Madoff was not sentenced to prison because of what he did with his money. He was imprisoned because of what he didn't do with his money, i.e. to give it to the investors who it belonged to. People who are punished for tax evasion are not being punished for spending their money on houses and cars - they are being punished for not giving their money to the government. This is all obvious, right? Yet for some inexplicable reason, the same mistake in describing the current situation in Israel vis-a-vis charedim and army is being committed by a wide range of people. I'm not talking about whether it is innately right or wrong, fair or unfair to other Israelis, or strategically wise or unwise to punish charedi draft-dodgers with prison. But in order to have any meaningful discussion about it, we have to describe the situation accurately. Nobody is being "sent to prison for learning Torah." They are being sent to prison for avoiding army service. They are not going to prison because of what they are doing with their time; they are going to prison because of what they aren't doing with their time. It's true that they are learning Torah while not being in the army, but it is inaccurate and inappropriately inflammatory to describe this as the reason for their going to prison. I don't agree with your comparison. What Madoff did with the money was incidental to his crime of tax evasion etc. Here, they will (theoretically) arrested for choosing "a" over "b". The fact there there will be penalties for yeshivot that have fewer inductees, and benefits for those with more, indicates that "what they are doing with their time when not serving in the army" is part of the discussion. But the punishment is not for choosing A. It's for not choosing B. The yeshivah penalties is just a way of encouraging the desired result. But what about the yeshiva bachur who was jailed for merely Wanting something? He was not jailed for wanting something. He was jailed for refusing something. Unfortunately, this is yet another reflection of the failure of both sides to carry out a real dialogue about the gius problem. The Haredi side always seems to portray it as "preventing people from studying Torah", when it is really more about asking what the responsibility of those who don't study it full time is to the rest of society. It is also unforunate to discover that Lapid is just another demagogue in the mold of his father. From what I understand, the Shaked committee was making progress on the matter with the quiet cooperation of the Haredi Knesset members, at least regarding those who are not stuyding full time, yet Lapid has proven he is more interested in grandstanding and deliberately strengthening the most extreme elements for his own cynical reasons than in making real changes in the Haredi society with the rest of the country. I had thought that Lapid was different, but I see that I was wrong. In any event, nothing is going to change since the criminal penalties would not go into force until 2017 when a new government will be in power. It also seems likely that even if the legislation passes with the criminal penalties attached, it will still be struck down by the Supreme Court and everyone will be back at square one, with just a lot more anger and machloket spewed out with nothing being solved. This is truly an unfortunate situation. As a supporter of the Naftali Bennett and the Bayit HaYehudi, I feel that there is no choice now but to break the alliance with Lapid. I just hope the tension now that exists between the Haredi and National Religious camps doesn't get any worse. Although in this case there has been a status quo, allowing chareidim to skip army service, as they had done before there was a state. Now a new state is imposed on them with forcing them to serve in a government that they don't agree policy-wise with. Gemarah Nedarim 32a says that Avraham descendants had to spend 210 years in slavery for his three mistakes, one of which was taking his disciples into a war. I wonder what price the state of Israel may chas v'sholom pay for taking today's disciples from study halls to jail? Gemara Sotah 44b obligates everyone in a defensive war, even a newly married Chasan and Kallah. The Rambam rules in accordance with that Gemara and not the one you quoted. What price might we pay for those who choose to ignore the Halacha? When you say "the state was imposed on them", it can be said that is true about ALL citizens, at least partially. For instance, an American citizen can say "I was not around to be consulted in the 19th century when the income tax was imposed on the country so I am not bound by it", but, of course, things don't work that way. All citizens are bound by the national consitutution and its laws whether they like it or not, but in a democracy, all citizens have a say in how things are run. If they are on the losing side of an argument because they are in the minority, they still have to accept it. In additon, the pre-state old yishuv of Haredim did not "own" Eretz Israel, even if they were here prior to the arrival of the Zionist movement. Eretz Israel belongs to ALL Jews, and all Jews have a right to live in it and thus participate in its political decisions. Thus, the claim that "we were here first" does not exempt the anti-Zionist religious elements from responsibilty to the state, and more important, to their fellow non-Haredi and even non-religious citizen/Jews. Nobody is being "sent to prison for learning Torah." Just like no one is "sent to jail for standing up for freedom" - they're arrested for "sedition" or whatever the charge. It's a statement that reflects the prisoner's motivation, not the jailer's. It's really a populist propaganda statement designed to vilify and incite hate against the jailer. In this case, it feeds into the paranoid belief that the State of Israel's very reason for being comes down to one thing: To destroy the holy Torah. The end result is that many people *do* in fact believe that yes, in effect he was arrested for learning Torah. You are quoting an Aggadeta and leaving it at face value? The Aggadeta raises more questions than it answers - Avraham set out to save Lot: this isn't a question of Pikuach Nefesh or Pidyon Shevuyim or Milchemet Mitzvah? Secondly, the Shitah Mekubetzet explains the issue was that Avraham did not pay them. So it need not be as you are using it. 2. Ignoring the pikuach nefesh and milchemet mitzvah/reshut aspects of army service is a fundamental error. As for your belief that God will punish Israel for enabling Torah students to defend themselves, their families, yeshivot and fellow Jews - maybe as a result of better (in quantity and quality) armed forces the security situation will actually improve? If the majority in Israel vote that no one can learn torah anymore must the charedim abide by that decision? Are the Amish exempted from certain laws? Are the Polygamists of Utah exempted? I don't know about Amish, but the Polygamist are not exempted, their first wife is married officially, the others pne only religiously, which is not forbidden by law and won't be considered illegal. RNS - you are being very naïve. Consider this: Obamacare says companies have to pay for health insurance that includes payment for contraceptive, or face fines or imprisonment. So when Catholic Patrick Mcdonald, who built his own company with his own sweat, and to whom birth control is as important as the Sabbath is to us, refuses to pay for it, he can be sent to jail. So now: is he being sent to jail for being Catholic, or because he didn't pay for the insurance policy mandated by the government? Do you see a difference there? I sure don't. This is a knotty problem because [as I've said before] no one, other than themselves, is a fan of the Charedi way of life. But to think the Yesh Atid platform is motivated purely by goodness, and not by simple anti-religious sentiment, is naïve in the extreme. Rabbi Slifkin, please explain your thesis: If it is indeed a LIE that according to the "Shaked" law the State would be punishing Jews for learning Torah, then you are in effect saying that certain "gedolei Yisrael" are LYING! How could that be? DF (Esq. ), your analogy is weak, to say the least. Given the way Obamacare works and its legal status, Patrick McdDonald (more likely Macdonald, as the Irish would spell it) is actually in a position which is much closer to that of a tax payer who knows of and lives with the fact that one's money goes to a whole lot of disagreeable things. Also, the Yesh Atid platform, as platforms of all political parties everywhere go, may not be motivated by pure goodness, but neither can one argue that it's driven by a supposed hatred of the Torah. How about a politically savvy motivation which takes into account the emerging dissatisfaction of Israel's public for a policy of exempting healthy young men while their children must serve, and for funding able Hareidi families from the responsibility of working for a living or even arranging for such? You do not see an obvious problem of glaring inequality, favouritism even? I think u are overlooking the bottom line. In both cases secular economic policy is being implemented and unfortunately Religion gets caught in the middle. Obama is implementing his social policy which requires the company to pay for health. It just so happens that health by definition of the secular state includes contraception. In neither case, is this about goodness or kindness. It is about implementing an economic policy they have taken to the electorate and been mandated to implement through democratic voting. In both cases it is not about anti religion but implementing a policy for the people. >>>> I wonder what price the state of Israel may chas v'sholom pay for taking today's disciples from study halls to jail? Lazar: I am truly very reluctant to ever comment in a manner that might insult another, but the abject inanity of your remark almost forces me. More learning does not protect the nation without also having more army. OK, you may believe it does, but as R’ Natan has pointed out often, the actions of most Chareidim prove that even they don’t believe it. Brings to mind a recent remark by one of the Satmar Rebbes speaking about the noticeable increase in cancer in his community, that more attention should be paid to Tzinius. Maybe. But, not a word about excessive obesity and smoking and other aspects of an unhealthy life style, which I am certain would help. While the life and death issues aren't quite as dramatic as with security matters, this is also something I think diaspora Jews should leave for Israelis to resolve. Temujin - taxpayers pay money into a general fund, and where that money goes afterwards is not their business. Here employers t are being asked to directly fund specific individuals with a specific product, antithetical to their beliefs. Totally different. Bobby - they can SAY its just about policy, but we know better. Example: An employer says he will not hire anyone who lives in the inner city, because statistics show people in those zip codes are disproportionately more likely to commit crime. The law says that's race discrimination, because it has a disparate impact on blacks, even though facially it has nothing to do with race. There's a thousand examples like that. At its core, Lapid & co are anti religion. Not just anti-charedi, but anti-religion. DF, Temujin is not unsympathetic to those opposed to the insane Obamacare provisions. But one is not sure why a plan everyone must pay into and which across the board includes coverage for birth control and abortions puts the conscientious objector in a much worse situation than being a tax payer who knows that one's money can specifically go to funding Planned Parenthood clinics, for example. Lack of choice and control of one's money, once surrendered to the authorities, tend to clear a person of actual and moral responsibility. Taking a peek at your comments to "Bobby" and yet another poor analogy, one is also not sure about there being specific laws which prohibit discrimination on the basis of location (many employers want their employees to live nearby). It is the proven act of discrimination, not the pretense with which it is achieved, that is at issue once the human rights tribunals wade into this one. Nor can this man understand how you can divine Torah hatred behind Yesh Atid policies. Regardless of what may or may not be in the politicians' hearts, you seem to be avoiding the legitimate issue of non-Haredi Israeli resentment over Haredi sons being exempt from national service and having to support families of those who refuse to enter the workforce. And one would also think that the last thing a principled and faithful Haredi scholar-for-life worth his salt would want to do is to take even a single dirty farthing from those horrid secular Torah-haters. Surely there is a sense of honour and trust in divine providence -- השגחה פרטית -- among them? Temujin as usual put his finger on the problem. The problem is not anti-religious politicians, the problem is public opinion. It is important to remember that the Israeli political system was set up not by Anglo-American liberals, but by eastern European Jews heavily influenced by Marxism, AND THIS INCLUDES THE RELIGIOUS PARTIES. They may not accept Marxism, but they have the attitudes of them. Though the word "democracy" was on their lips, they actually hold the average person and his or her opinions in contempt. Thus, the political system in Israel was designed to prevent the population from having much influence on public policy, and instead placing actual power in groups like the Histadrut or the Supreme Court or other elitist groups that were impervious to public control. Thus, the tendency of the ruling elite is to dismiss public opinion as being "uninformed" (recall Ben-Gurion's infamous comment which I heard repeated by Peres and Barak-"I don't know what the people want, I know what's good for them!"). This is what leads to the Haredi leadership tending to disregard the real unhappiness of the public regarding the question of Haredi participation in the IDF, or national service and the workforce, and for them instead to project the problem as merely "incitement by anti-religious politicians" and if somehow these individual politicians can be neutralized, everything will go back to normal, the public will go back to sleep on these matters and the Haredi political parties can return to using their swing vote position between the Left and Right blocs to maintain the status quo. This is no longer tenable. Even if Lapid and his party decline or even disappear as most people think will happen in the next election, these matters WILL NOT GO AWAY. Take a look at this "שקרים ואמיתות בחוק הגיוס". Remember the Jewish wars of the past and learn. The U.S. ordered the Israel government not to lift a finger against Iraq. Even the Arab nations joined in conquering our enemy without any Jew having to sacrifice his life. That is what happens when you have more Jews learning in yeshivas. "What fools these mortals [secular jews] be!" I'm not sure what you're getting at here, other than what sounds like some post hoc ergo propter hoc reasoning. The Amish are exempt from certain laws (Mormons, including the FLDS are NOT), but they also don't get the benefit of most government services. Also, nobody is proposing banning learning Torah - they're proposing requiring military service. Haredim can still learn when they're not serving in the military. Personally, I think it would be perfectly fair and logical to do something similar with the Haredim - allow them all the Yeshiva learning they want and exemption from military service, at the cost of not getting any help from the government other than criminal law enforcement.